So often in my teaching I do stuff - or have the students do stuff - without a really good pedagogical justification in mind before we do it. Sometimes it goes badly but more often it turns out awesome! This is a tale of the awesome. 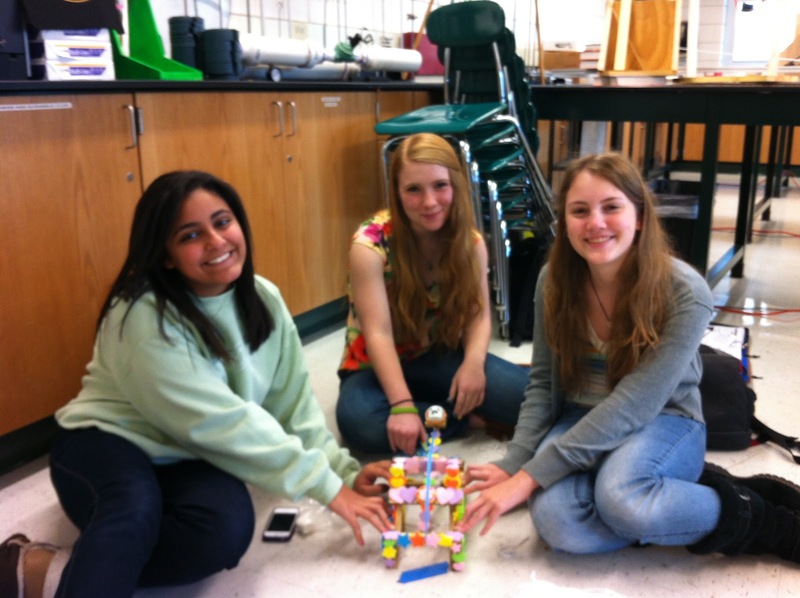 A couple of weeks ago I assigned the kids a building project called the Marshmallow Catapult. The task is to build a catapult (usually out of wood) that can shoot a marshmallow 5 meters into a bucket. It has to have a triggering mechanism (they can't just pull it back and let it go). But pretty much, that's it. This seems pretty open to interpretation and it really is. The kids really have to figure out, how to build a catapult, how to get it to go 5 meters and how to make it adjustable enough so that if they are too short or too long they can make changes during the shooting. I don't really have examples around and I don't give them much in the way of instruction. And we don't talk too much about what's important. They are really on their own. But they know the expectation and its up to them to make it happen. In past years I've assigned this AFTER we studied projectile motion which meant that kids would have a working knowledge about the relationships between launch angle, launch speed and horizontal range. But this year I assigned it BEFORE in the hopes that they would discover some of these things on their own; kind of an organic discovery process. This shift is new for me and it part of my goal to incorporate some PBL into my teaching. 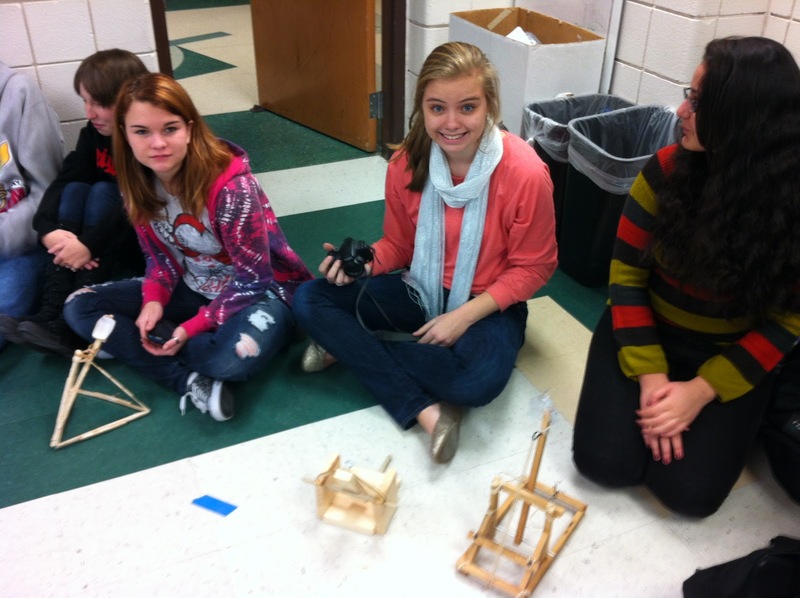 The kids' catapults were awesome! The shooting was so FUN! The kids had a great time and really celebrated their success and the hard work that lead to it. We were able to talk so much about projectiles and now that they had an experiential sense of it I think our discussions will be so much more fruitful. 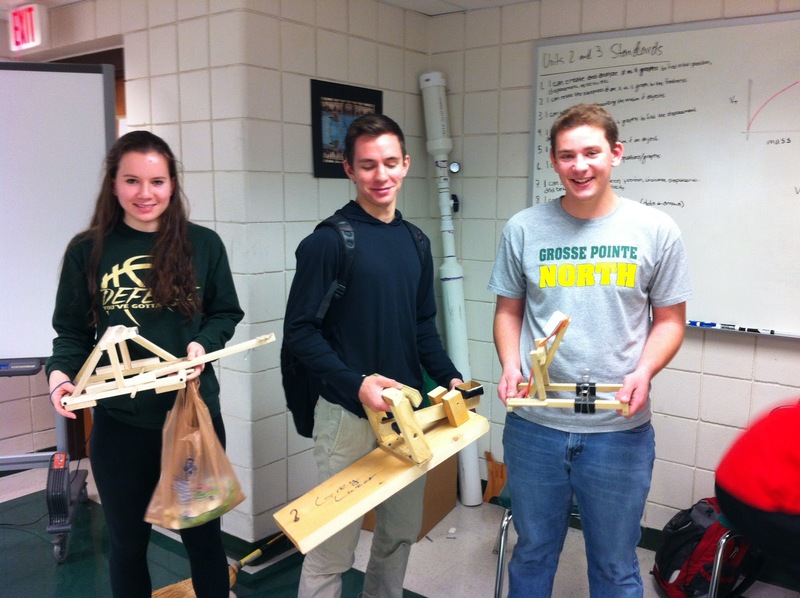 In three of my physics classes there were 54 catapults (for about 95 kids). They could work in groups up to three. Of the 54 catapults 30 shot the marshmallow into the bucket, 9 hit the rim 8 at least shot the marshmallow around 5 meters and there were some that sucked! The best part for me and for the kids is that any group that didn't meet their own expectations can re-tool or re-build their catapults and try again next week (this time after school). You always have a chance to meet the expectation. I know that building projects can be a great addition to the classroom and even though I may not have the best pedagogical justification for it I know that the kids got so much out of it that I'll continue to do it in the future! Jealous. In the middle of the Mousetrap Car right now, and I had a few students tell me openly (in class, in front of everyone) "this is stupid, I don't want to build stuff." And the attitude doesn't get any better when I insist that I'm not telling them how to build one (but I do emphasize the basics, like having a lever arm that drives an axle). I do enjoy your twist on the catapult - I used to use golf balls which obviously required being outside, which meant either freezing, or assigning the project nowhere near projectile motion. Good call. is this blog ever going to upd9?